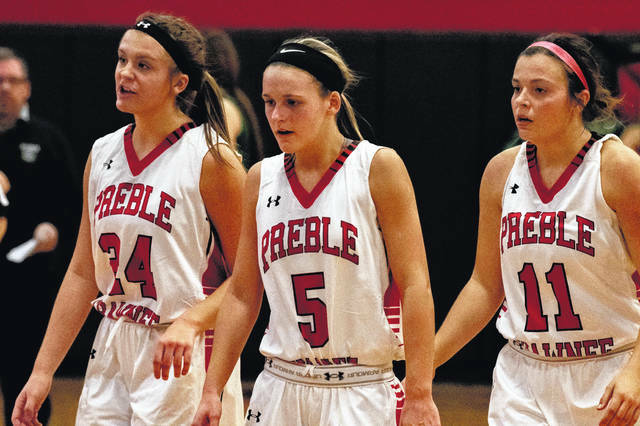 Preble Shawnee seniors Logan Hollon (left), Jenna Lovely (middle) and Brenna Woodard all played key roles during the first week of the season for the Arrows. 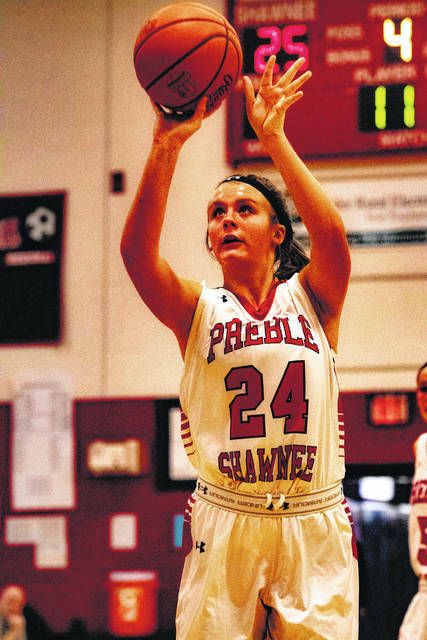 After falling to Badin 44-40 in overtime, Shawnee rebounded to beat Brookville (39-27) and Northridge (56-32). 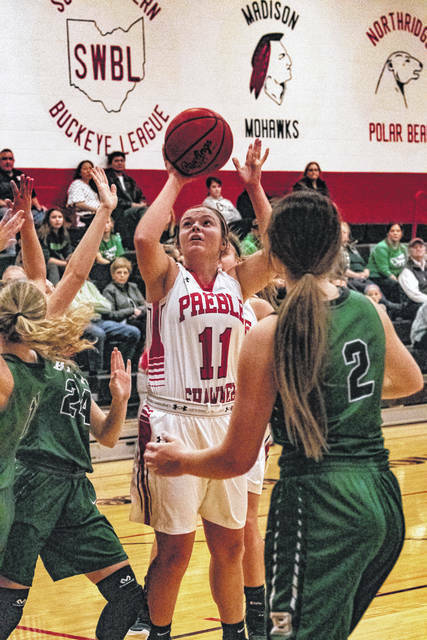 CAMDEN — After opening the season with an overtime loss to Hamilton Badin, Preble Shawnee’s girls’ basketball team rebounded with a pair of wins. The Arrows tipped off the season on Monday, Nov. 26, at home, against the GCL Co-Ed Division Rams and overcame a 9-point second-half deficit before falling 44-40 in OT. Shawnee closed the week with a 39-27 win at Brookville on Thursday, Nov. 29 and beat Northridge 56-32 on Saturday, Dec. 1. 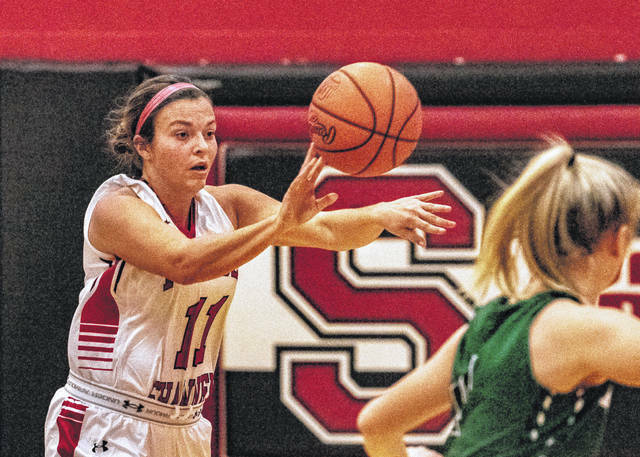 Senior Logan Hollon paced the Arrows with a game-high 22 points against Badin, scoring 10 in the second quarter to help her team overcome a 10-point first quarter deficit. Shawnee trailed 17-7 after the opening quarter. With the game tied at 22-22 at the half, Shawnee went cold in the third quarter, scoring just a single point. The Rams extended the lead to 32-23 after three. In the fourth, Hollon tallied six points and senior Jenna Lovely dropped in five of her eight on the night as the Arrows battled back to force overtime. In the extra stanza, the Shawnee was outscored 4-0. Lovely added seven steals, six assists and five rebounds. Senior Brenna Woodard tossed in seven points and had five steals. Against Brookville, Woodard scored a game-high 17 points as Shawnee gradually pulled away from the host Blue Devils for its first win of the season. Woodard added four assists, three rebounds and three steals. Lovely contributed nine points, six rebounds and five assists. Junior Cami Hollon tossed in eight points and pulled down four rebounds. The Arrows led 5-3 after the opening quarter and 16-11 at the half. Shawnee outscored the Blue Devils 23-16 in the second half. At Northridge, in its Southwestern Buckeye League Buckeye Division opener, Shawnee outscored the host Polar Bears 37-15 over the second and third quarters and cruised to the win. The Arrows held a 10-8 lead after the first quarter before exploding for 24 points in the second to take a 34-15 halftime lead. They extended the lead to 47-23 after three quarters. Lovely led the way with a game-high 20 points. She also had eight rebounds, four assists and a pair of steals. Senior Kaylie Campbell added 11 points and nine rebounds. Woodard chipped in seven points, four rebounds and three assists. Logon Hollon and junior Jasmine King each contributred six points. King also had six rebounds. Shawnee (2-1, 1-0 SWBL) was scheduled to play at Dixie (0-4, 0-2) on Tuesday, Dec. 4 and will host Waynesville (2-0, 1-0) in a key divisional game on Thursday. 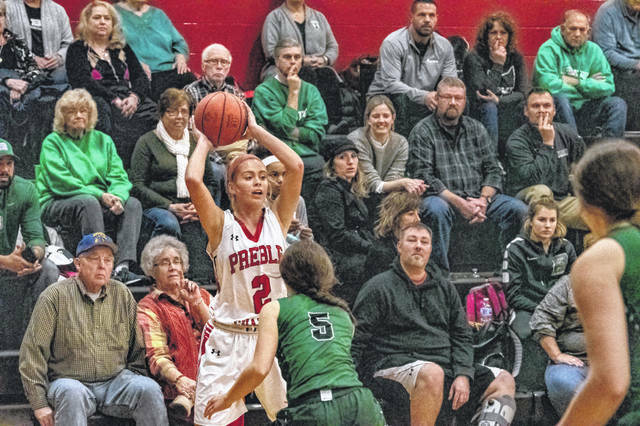 https://www.registerherald.com/wp-content/uploads/sites/41/2018/12/web1_psgbk6.jpgPreble Shawnee seniors Logan Hollon (left), Jenna Lovely (middle) and Brenna Woodard all played key roles during the first week of the season for the Arrows. 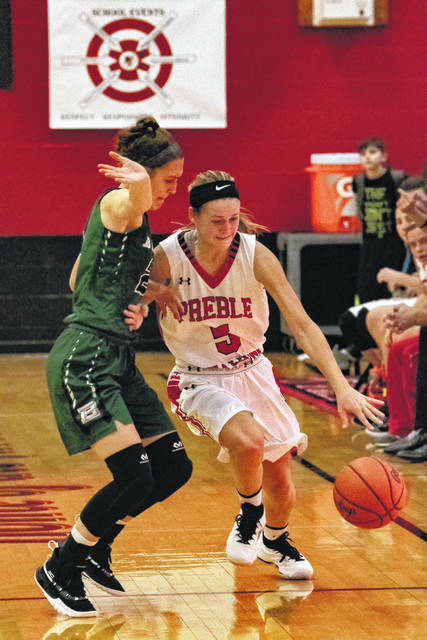 After falling to Badin 44-40 in overtime, Shawnee rebounded to beat Brookville (39-27) and Northridge (56-32).